We offer worship services every Sunday morning at 10:30am that are diverse in focus and often form. Our minister speaks three Sundays each month. Other Sundays may feature inspirational and spiritual services by visiting ministers, guest speakers, members, and friends. 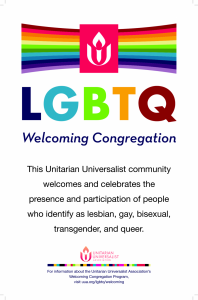 Sermons are a central element in Unitarian Universalist worship and may address mystical, political, ethical, or historical topics. Often a minister’s personal testimony will help members of the congregation reflect honestly on their own lives. Occasionally a sacramental expression – the Flower Communion in June, a child’s dedication, or the invitation to share personal statements – enhance our services. These special ceremonies serve to bind us to traditions, to the generations, and to holy ideals. We believe in the value of an inter-generational society and invite our young people of all ages to participate in at least a portion of every Sunday morning service. Child care is provided if needed. Members and guests gather together for coffee, continued discussion, and fellowship following the program. Our choir sings for at least two Sundays each month. Whatever your spiritual journey, you are welcome here. We hope you will feel comfortable enough to stay and join us – if not this time, some other Sunday.